Meet Dr. Donald Munson. Dr. Munson has a PhD in Zoology and was chair of the Biology Department at Washington College for 12 years and director of Environmental Studies for 15 years. In 1990 he was awarded the endowed chair, the Joseph H. McLain Professor of Environmental Studies, which he held until his retirement in 2013. Since 1997, Dr. Munson has been bringing Washington College students to BIOS during the summer to teach a class on coral reef ecology. 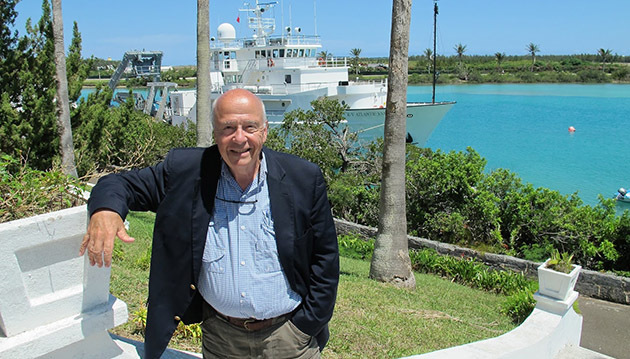 Although he retired from teaching, Dr. Munson is back in Bermuda to train another professor to take over the program. I was able to sit down and speak with Dr. Munson one sunny afternoon at BIOS, and ask him some questions about what it has been like coming to BIOS to teach over the past 18 years. Dr. Munson was full of admiration for BIOS, and couldn’t say enough great things about the station. It was so interesting to hear about BIOS over the years from the perspective of a long-time visiting professor. Read our blog for an interview with Dr. Munson. Reflecting on your past 26 years at BIOS, what are some of your most memorable moments? Although I have many memories of Bermuda friends (some unfortunately gone), I still think of people here whose friendship has meant (means) much to me. I hesitate to start listing names because I will leave some out, but Jane Burrows, Butch, Bomber (boat captain), the staff in Wright Hall, chefs, and many more, have made my time here quite wonderful. However, my most memorable moments are family moments. I was fortunate to have been awarded Grants–In–Aid for several years (1992 – 2013) that made it possible for my family to accompany me for 2-3 weeks on station during summers. My children are now 33 and 31 respectively, but I still can vividly recall when we stayed in 'Jet Stream' and we would fish and swim at the 'cement beach'. They were good family times that I will never forget. Those memories continue to draw me back to BIOS. My family still fondly remembers those times spent together here. In our brief discussion earlier, you mentioned how BIOS was one of the best stations that you have visited. Can you elaborate on why this is the case? It is the safest and the easiest to reach. Money is the same as the USA. Medical facilities are fine. Through the years I have had to take a few students to [the] hospital (small things – allergic reactions, stubbed toes, etc.). Myself and the students were always treated well and with respect. What do you think you will miss most about coming to BIOS? I will very much miss the friendships, both on and off station, that I have been fortunate to have developed through the years. Again, too many to list, but it goes from scientists, to bartenders, to shop owners/managers, bus drivers, etc. I will truly miss them but will continue to return whenever I am able to do so. If you had to choose one word to sum up your experiences here, what word or words would you choose? Why? It has been a most wonderful “Bermudaful” experience. Lastly, do you have a personal favorite quote or life mantra that you follow? What is it? The only person you should compete with is yourself. The rest is extraneous, irrelevant and wasted effort. It takes much of one’s life to learn, and accept, that. True love is what “it’s” about.